Two new homes perfectly suited to coastal living are now open to the public at the Dennis Family Homes display centre at Warralily Coast estate in Armstrong Creek. The Macedon and the Brookdale are popular designs in the Inspirations Series from Dennis Family Homes. The Macedon has been built to showcase the upmarket specifications of the Premium range and the Brookdale features the more affordable Essence range of inclusions. Both displays highlight some of the many optional extras that are available through Dennis Family Homes. Designed with growing families in mind, each home features open plan interiors and plenty of space with a central kitchen/living area, four bedrooms, two bathrooms, a study and two other living spaces. The Macedon design features the master bedroom suite at the front of the home, away from other bedrooms, and the Brookdale has all bedrooms together with the master suite at the rear. Both designs are available in a choice of eight contemporary facades. Visitors to the Macedon are welcomed into a timber-lined entry with concrete-look porcelain tile flooring that runs through the home’s living areas. The timber features and the sleek tile styling create a sophisticated urban-industrial feel and are available from Dennis Family Homes as an upgrade option. The front door with sidelights and high ceilings are included in the Premium range. “Visitors to the display have been particularly impressed by the colour scheme featured in the Macedon, commenting that the use of concrete and timber tones combine to create a very contemporary interior,” says Phillip Shaw, Geelong Area Manager for Dennis Family Homes. Central to the home is the open living area with its spacious kitchen. The kitchen continues the urban feel with upgraded concrete-look stone benchtops and a stylish combination of light and dark coloured laminate cabinetry. The large kitchen island on display is one of five available to customers who chose to build with the Premium range of inclusions. Also included in the Premium range are the 40mm thick stone benchtops in the kitchen, butler’s pantry and laundry. Featured as an upgrade are the stunning stacking slider doors in the living area which, once open, create a five metre wide entrance to the very spacious alfresco area, which can accommodate a large outdoor setting. “This is a simple way to add great impact to the living area as the doors offer an uninterrupted access to the beautiful alfresco area,” says Mr Shaw. The master bedroom suite is located towards the front of the home, privately accessed via a hallway off the front entry. Luxury features include his and her walk-in-robes and an ensuite with a large shower and separate toilet. The three minor bedrooms are at the rear of the home, providing privacy from the family spaces. A study opposite the kitchen provides a separate work area that is close enough for parents to supervise the kids. Suitable for construction on blocks from 16 metres wide, the Macedon design on display is 33 squares. It is available in another two sizes ranging from 32 squares to 35 squares and is available in a range of House and land packages across a number of Geelong land estates. Built to the Essence range of inclusions, the Brookdale display at Armstrong Creek has been finished with a “beachy” interior theme that perfectly complements the weatherboard and brick façade. Included in the Essence range are the stone benchtops, stainless steel appliances and the on-trend subway tile splashback with contrasting grout that is featured in the kitchen, bathrooms and laundry. The Brookdale’s floorplan now includes a larger pantry as standard. The textured laminate cabinetry, timber-look flooring and higher ceilings are optional upgrades available from Dennis Family Homes. The Brookdale’s floorplan features a family wing, with all four bedrooms accessed by a hallway off the kitchen. The master bedroom suite, complete with a walk-in-robe and large ensuite with double vanity, is at the rear of the home overlooking the alfresco area. “The feedback has been very positive and visitors are pleasantly surprised by the high quality of the Essence range inclusions,” says Mr Shaw. 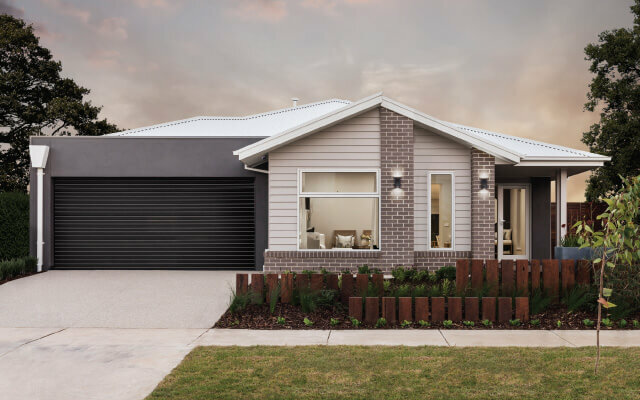 Suitable for construction on blocks from 14 metres in width, the Brookdale design is available in a choice of three sizes ranging from 24 squares to the 29 square version on display and is available in a range of House and land packages across a number of Geelong land estates. The displays are open daily from 11am to 5pm at Maroubra Street, Armstrong Creek. Further information is available online at www.dennisfamily.com.au or by phoning 1800 DENNIS.